Greg Dyke, the former BBC director general, has received an award from a racial equality group after branding the BBC "hideously white". Dyke made the remarks in January 2001 regarding the lack of staff from ethnic communities working at the BBC. He was recognised by Empower Scotland, which fights workplace racism, during a ceremony in London, on Monday. Talking about his comments, Dyke said: "I looked around at the staff and there was no other conclusion I could reach." But he added: "Since I made them, things have changed quite a bit. "I'm pleased to say there are now many, many more employees from ethnic minority groups working for the BBC." Mr Dyke was in charge of the BBC from 2000 until January this year. 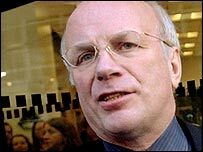 He was forced to resign after the Hutton report concluded the BBC had been wrong to claim the government "sexed up" the Iraq weapons dossier. Tesfu Gessesse, the chairman of Glasgow-based group Empower, urged other employers to take notice of Dyke's workforce remarks. He said: "We admire Greg immensely for his comments. "It showed bold leadership for him to make that remark. He is a role model for others in British business and life."